Use of a traditional lay-on protruding door has a number of advantages in electrical or electronic control enclosures since it ensures the greatest usable door area almost to the width of the frame and can often open to 180º even when cabinets are mounted side by side. We have therefore developed an extensive range of hinge types under the 1030 series umbrella, so as to ensure that builders of custom and standard panels can easily find a suitable item for flange returns within the 16mm to 25mm range, or greater. 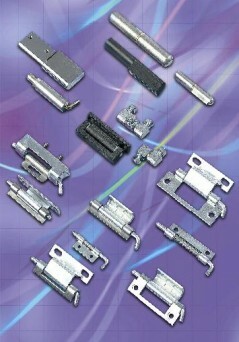 The EMKA 1030 series hinges feature types which fit externally and versions which are concealed internally. Installation methods include screws, welding or stud fixing. All the 1030 series may be demounted with the door open to improve access to the interior or to door mounted equipment during maintenance or build/installation. This has been achieved by use of a lift-off design or removable pins. This type of cabinet comes in many different types and sizes and are used in environments from offices/factories to oil rigs – so 1030 series hinges are supplied in a range of appropriate materials and finishes. These include: mild steel in ready for weld and paint, or zinc plated; zinc die cast finished in chrome or black powder coat; or stainless steel, for the best in strength and corrosion resistance. Up to 2m plus height door units are catered for using multiples of 2, 3 or 4 hinges per door, in order to accommodate the weight of the door itself and its indicators, controls etc.